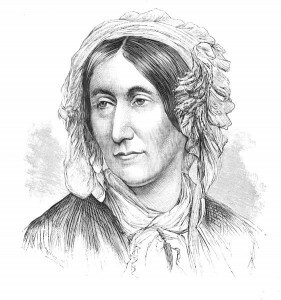 Mary Fairfax Somerville was a Scottish scientist, mathematician, writer and polymath dubbed the Queen of Nineteenth Century Science. How’s that for an introduction! Mary was born in 1780 into distinguished family of Fairfaxes in Jedburgh, Scottish Borders, the fifth of seven children, and spent her childhood in Burntisland, Fife. Mary had two brothers, one younger and one older, who were given a good education but Mary’s parents saw no need to provide an education for their daughter. Mary’s father spent a lot of time away from home, at sea, and her mother insisted only that Mary learned to the read the Bible and to say her prayers. When Mary was 10 years old, her father thought her “a savage” and sent her away to an expensive boarding school. It was not a success and she returned after just a year and was, thereafter, schooled by tutors in elementary geography and astronomy but not to the same level as her brothers. That said, when she overheard her brothers tuition in mathematics she answered the tutors questions when her brother could not. Thereafter the tutor allowed her to continue, unofficially, with lessons in mathematics. In addition, she managed to obtain a copy of Euclid’s Elements of Geometry and began to teach herself from it. Not all of her relatives discouraged her learning. When visiting her uncle back in Jedburgh Mary told him that she had been teaching herself Latin. Far from being cross, her uncle encouraged her and the two would read Latin before breakfast. Mary was encouraged to learn instead the many skills that were seen as essentional for a woman; she learned needlework, how to play the piano and was given lessons in painting from the artist Alexander Nasmyth. In 1804 Mary Fairfax married Captain Samuel Greig, a captain in the Russian Navy, who also opposed Mary’s studying. Following his death the inheritance she received gave her the freedom to pursue her scientific interests, choosing to study astronomy and mathematics in particular. She began solving mathematics problems and won a medal for a solution she submitted to a mathematics journal. Her study was further encouraged by her second husband, surgeon Dr. Somerville, to maintain contacts with the leading scientists of the day. Mary published scientific papers based upon her own research, and also critiqued the ideas and work of other scientists. Her writings prompted fellow researcher John Couch Adams to search for the planet Neptune, and he was later credited as a co-discoverer. She carried out experiments on magnetism, presenting her paper ‘The Magnetic Properties of the Violet Rays of the Solar Spectrum’ to the Royal Society – although since women were not allowed to attend meetings of the Society at that time it was actually read by her husband on her behalf! Lady Byron and her daughter Ada Lovelace were friends of the family and Mary helped Ada and encouraged her to study of mathematics. This work at once made her famous. Her work continued to attract praise and in 1833 Mary, along with Caroline Herschel was named as an honorary member of the Royal Astronomical Society. They were the first women to be so honoured. From 1835 she received a pension of £300 from the government and in 1869 she was awarded the Victoria Medal of the Royal Geographical Society. Aged 86 Mary had signed John Stuart Mill’s unsuccessful petition for female suffrage. Mary Somerville died in Naples, just before turning 92. Her legacy lives on in the vast number of objects named after her, from houses to celestial objects, including Somerville College, Oxford.